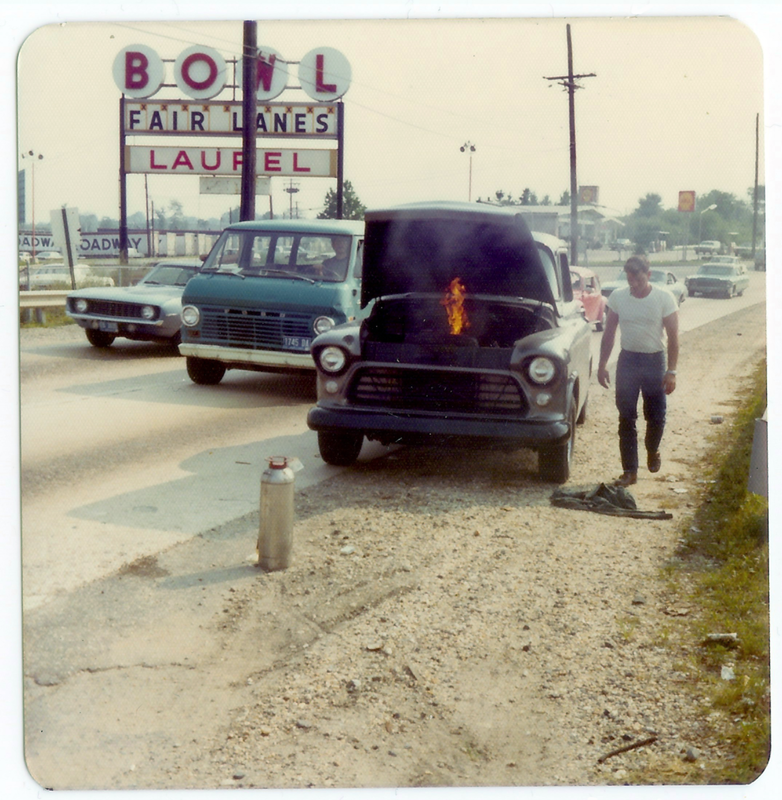 I found this pair of roadside photos, taken by John Floyd II in 1974, fascinating from the first moment I saw them. Not just for the classic cars, or the road sign cemented into an old tire, or even for the awesome carburetor fire. 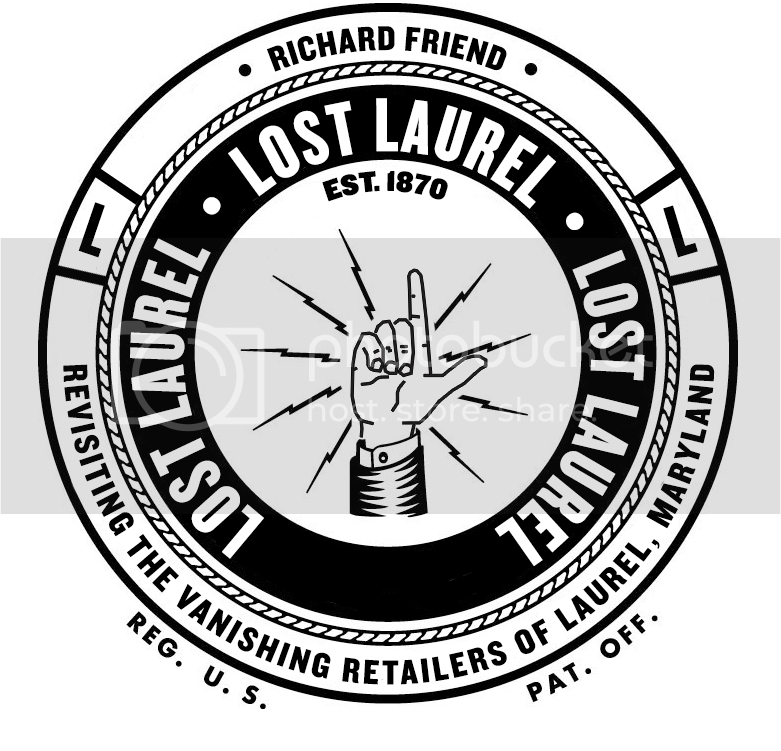 No, it was the huge, old Fair Lanes bowling alley sign that pulled me in; the same old sign that dominated the intersection of Baltimore Ave. and Bowie Rd. throughout my youth. It was a sign I used to see at some point every day, living just around the corner at Steward Manor Apartments. 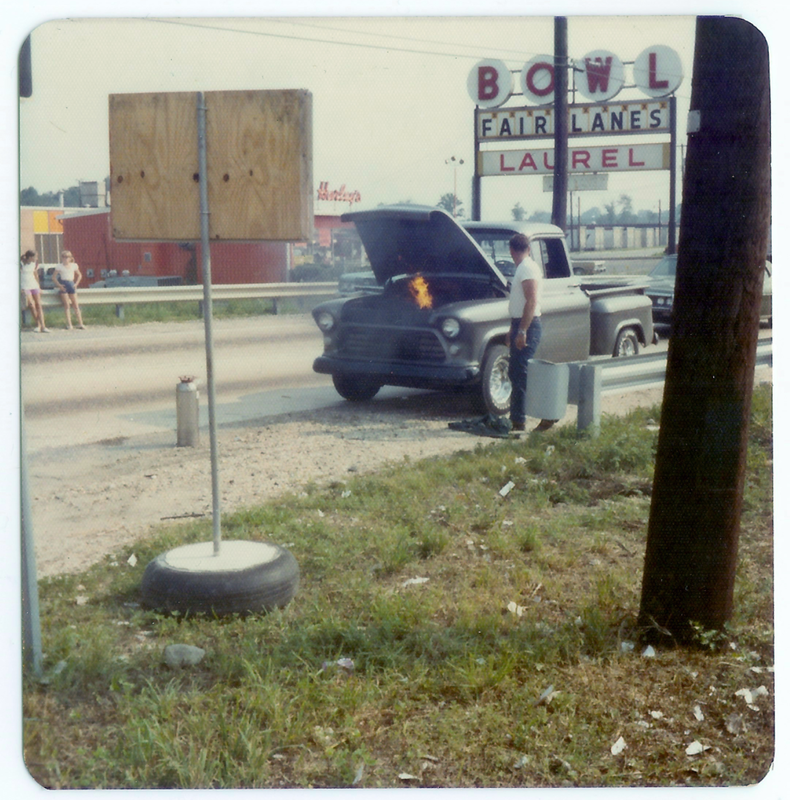 It was a sign that, well, actually made you want to go bowling. When Fair Lanes was eventually bought out by AMF (the banner under which it remains open today), it just wasn’t quite the same. 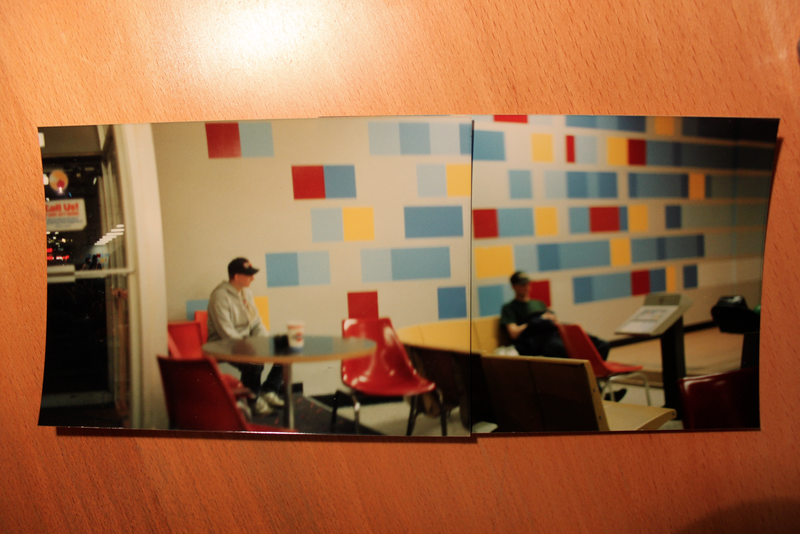 Before snapping these photos, John spent some time inside the bowling alley as a kid, himself. 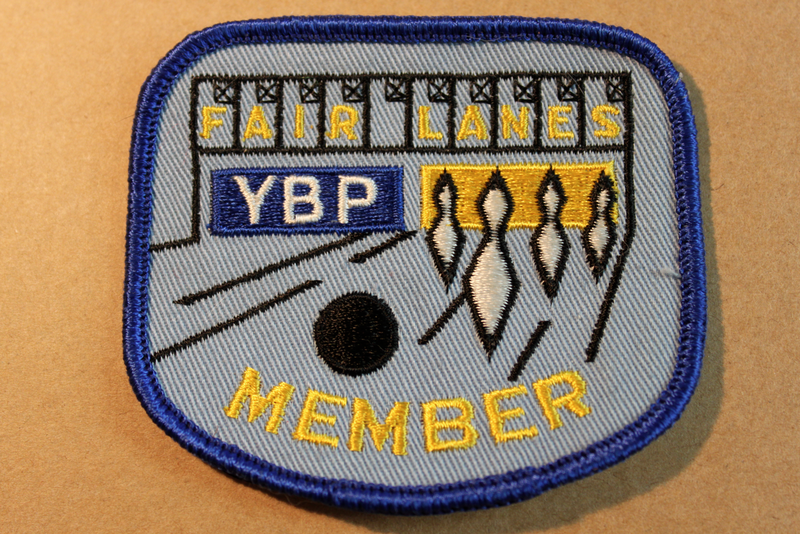 And as part of the local Boy Scout troop, he joined the Fair Lanes Youth Bowling Program for the Winter 1971–72 season. 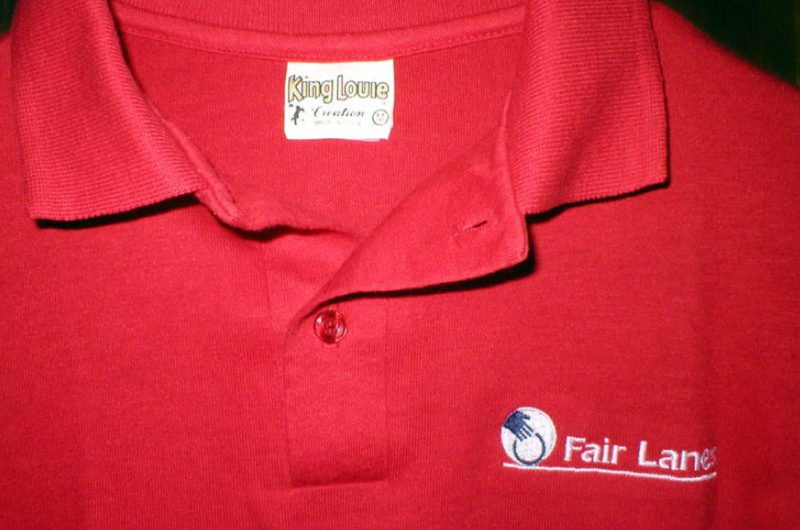 By the time I started going bowling and joined my first league in the mid-1980s, the Fair Lanes brand was beginning to evolve. But even as the logos changed, the old sign remained out front. 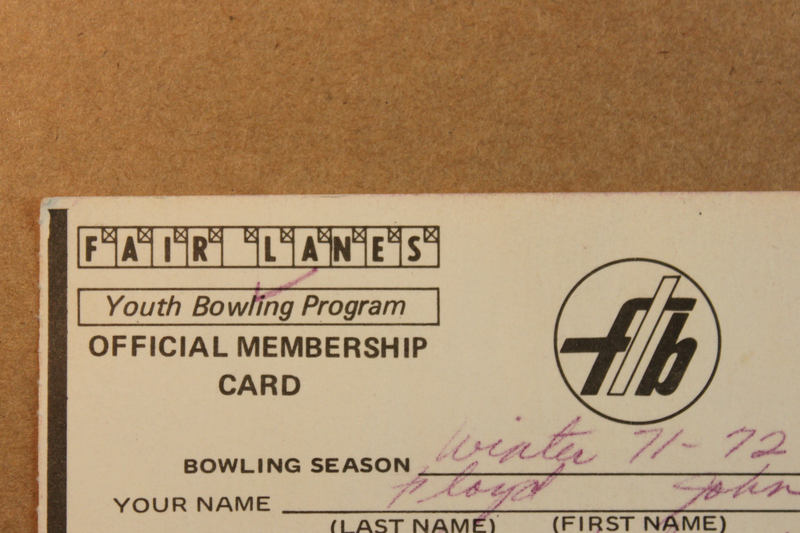 While the Fair Lanes brand was becoming more cohesive throughout the 80s, the bowling alley itself retained much of the old school ambiance that earlier generations had experienced: scores were kept manually—handwritten on transparencies and projected onto the scoreboard above each lane. There were ashtrays on tables, because people smoked. There was a row of video games and pinball machines in a small nook near the bathrooms, and a vending machine that reliably contained Mike and Ikes. (I always bought Mike and Ikes—they seemed to magically improve my game). There was an old-school diner with swivel stools; the pizza wasn’t memorable, but the fries were always a treat. Bowling alley fries are one of this country’s best kept secrets, by the way. And then, of course, there were those shoes. If you were lucky, they’d have a pair of nearly-new shoes in your size. 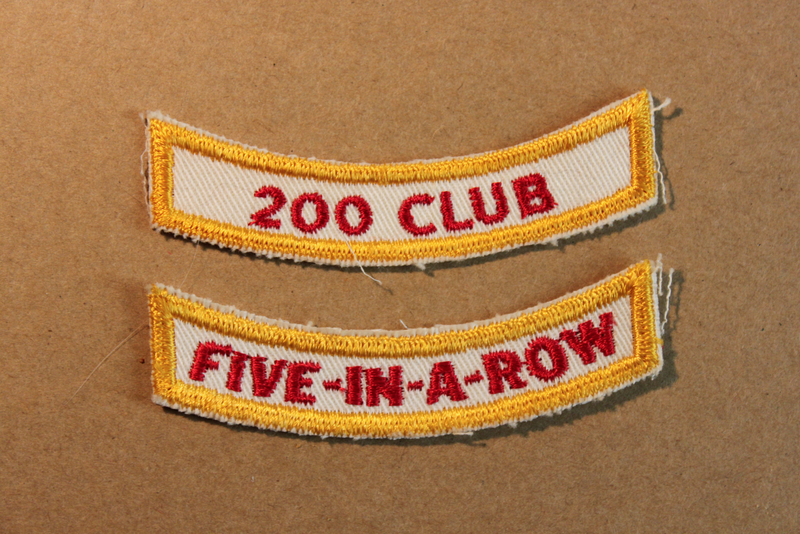 But more often than not, you’d be sporting a pair that somebody probably wore over 20 years earlier. But you never worried about acquiring trench foot or the like, because the attendant would always generously spray that potent disinfectant into the shoes before and after your turn. In hindsight, I wonder how much that contributed to the ozone problem? But I digress. On the entrance side of the main desk, they had what amounted to a small pro shop—where you could buy bowling gloves, towels, etc. 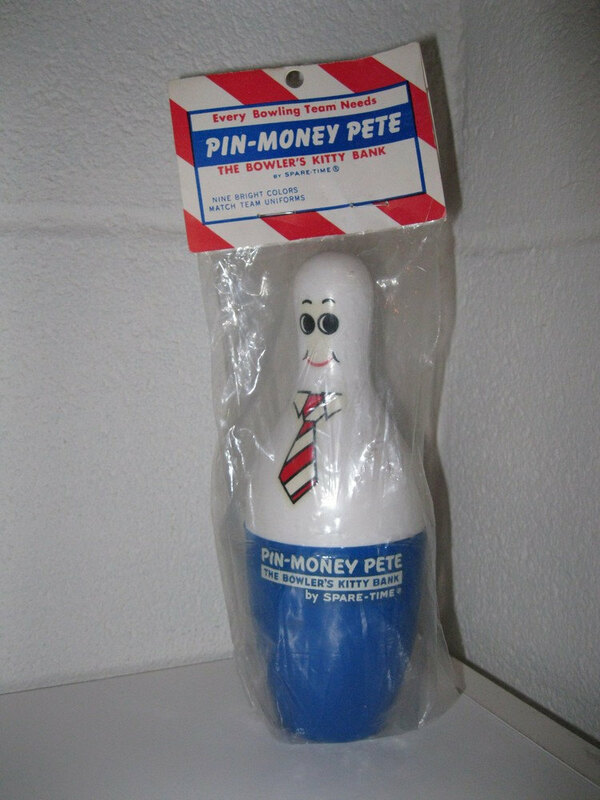 They also sold “Pin-Money Pete”—a bowling pin shaped coin bank. 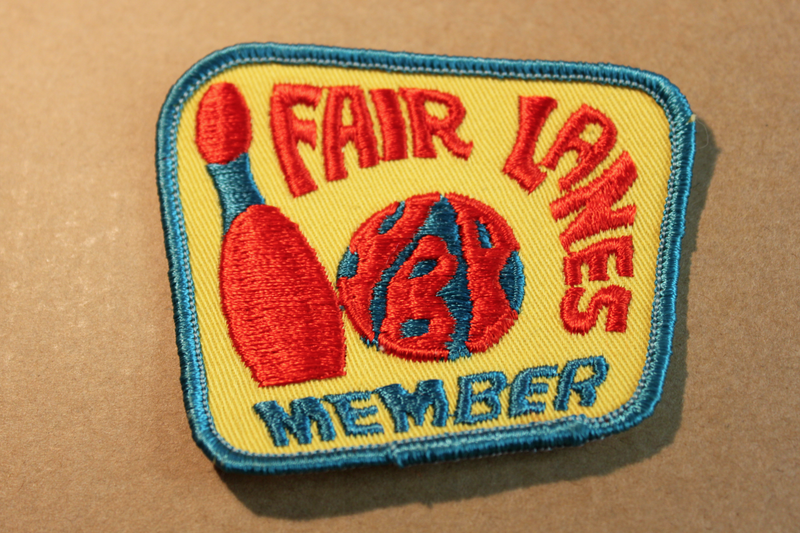 One of my earliest Fair Lanes memories is of my cousin Jenny getting the girls’ pink version, while I opted for the blue. 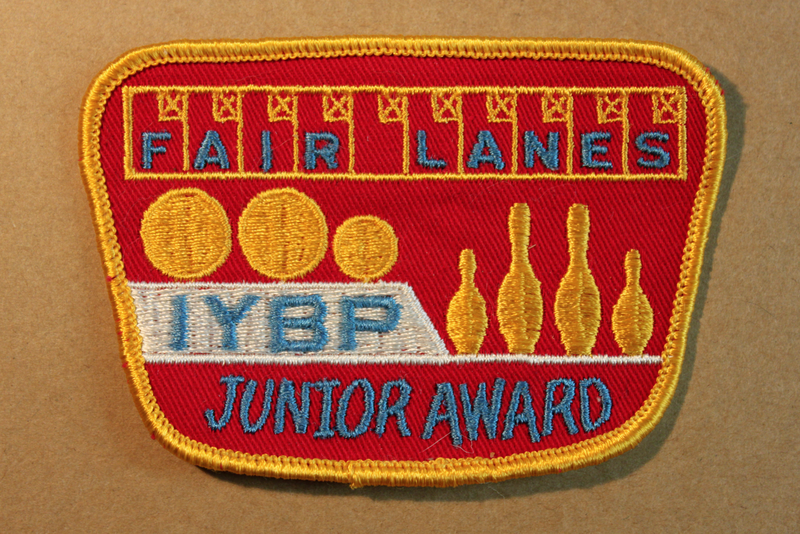 If memory serves, I only actually bowled in two duckpin leagues as a kid. Both were Saturday morning leagues, and I’d typically walk the short distance from Steward Manor to the bowling alley, undoubtedly psyching myself up along the way. I was never a great bowler by any means, but I was decent. I did even better after my box of Mike and Ikes. Aside from the leagues, I’d bowl occasionally with friends from the neighborhood, or with my dad. 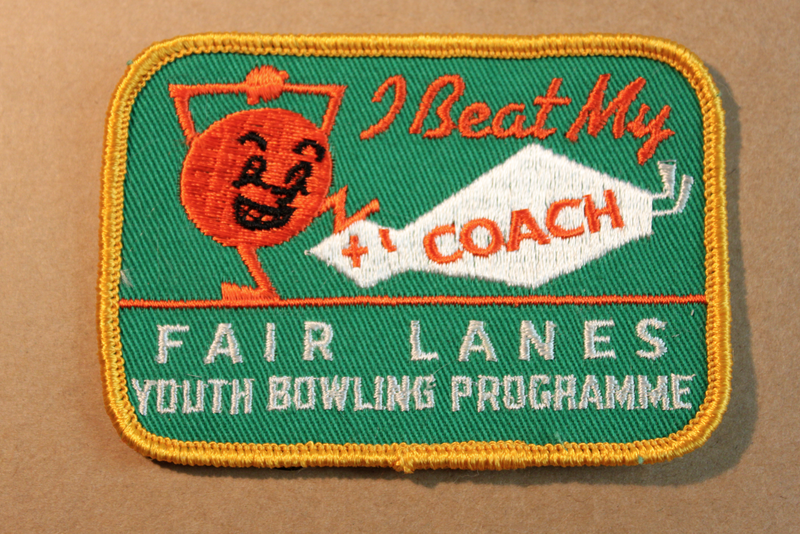 I used to hate those times when we’d find the place packed with league bowlers, though, and no lanes available. That actually happened quite frequently in the 80s. Fast-forward to 1992, and I was two years out of high school and stressed out with college. Rodney Pressley, one of my oldest and closest friends since the first grade, had the idea that we should join a bowling league. “It’ll be a good stress-reliever”, he suggested, and it sounded like a fun idea. So we did it—he and I signed up for a weekly doubles league. The duckpins had been sacrificed a few years earlier in favor of additional ten pin lanes, so we’d be playing with the big boys this time. Also gone were the old handwritten score sheets. 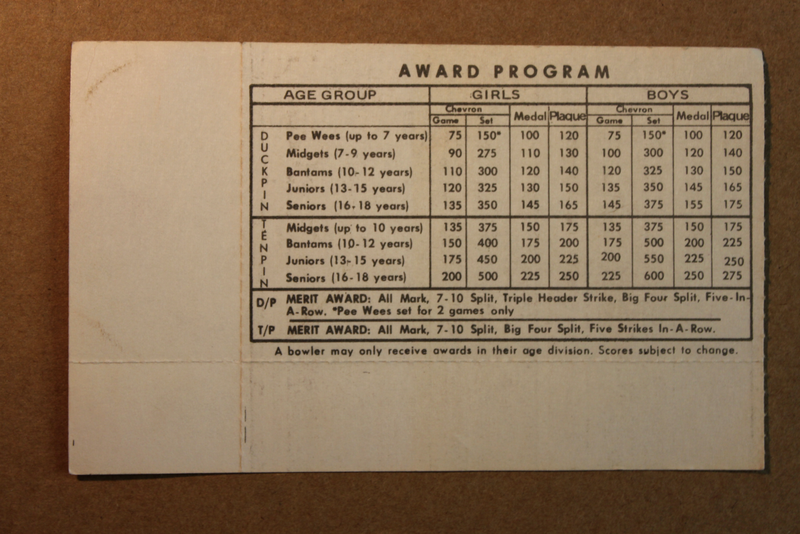 Each lane had its own electronic scoring system that basically did all the work itself. Out of practice and unmotivated, Rodney and I lost all three games that first week. We lost them badly—to an older gentleman and his grandson, if I recall correctly. It was embarrassing. Over the next couple weeks, we improved… and actually started winning games. 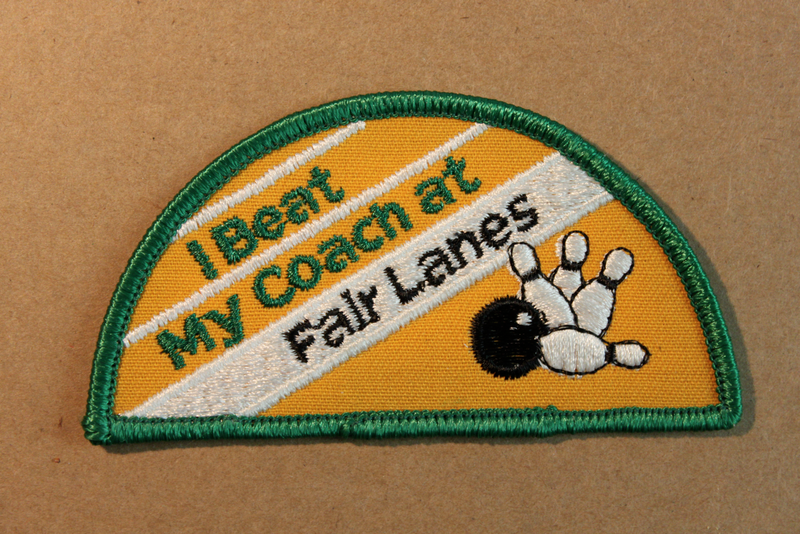 This prompted daily practice sessions at Fair Lanes, followed by trips to nearby Dart Drug for Bengay and Tylenol. (Don’t underestimate the muscle pain that frequent, aggressive bowling can provide). By the fourth week of the season, Rodney and I actually made it to first place—surprising nobody more than ourselves. And even more surprising, it was a lead that we never gave up. For the next 8 weeks, we remained in that top spot—but never by more than a game and a half. It ended up being ten times more stressful than anything either of us had ever undertaken before. 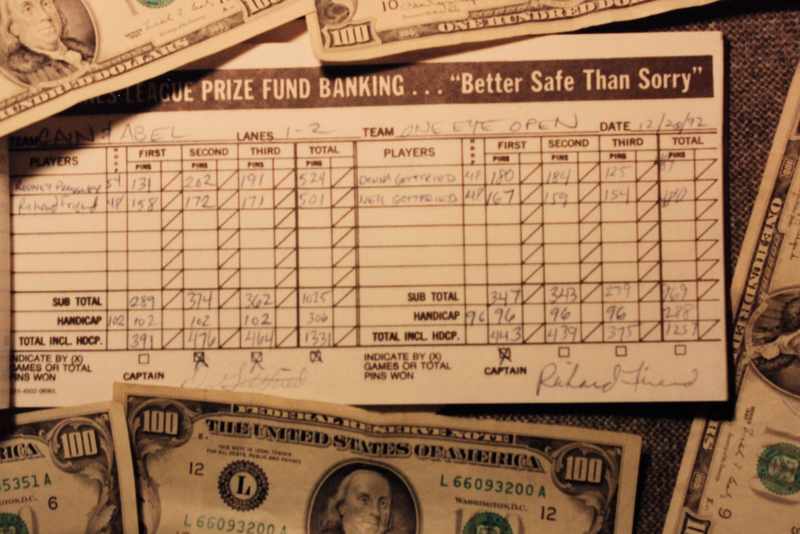 For two months, we basically lived in that bowling alley, committed to holding onto our slim lead and ultimately winning that most prestigious of prizes in all of sports. (Hey, it was a thousand bucks!) The stakes were high, indeed. “A good stress-reliever”, I often kidded. Rodney didn’t laugh. Rodney’s twin brother, Ronald (left) skipping Monday Night Football to watch our game. So, the stage was set on the final Monday night of December, 1992. Rodney and I would be squaring off against the team currently in close second place—a tenacious husband and wife team who called themselves, “One Eye Open”. The air was thick with tension; or maybe it was just smoke. But I digress. We were assigned lanes 1 and 2 for this championship round, which neither of us were particularly thrilled about. 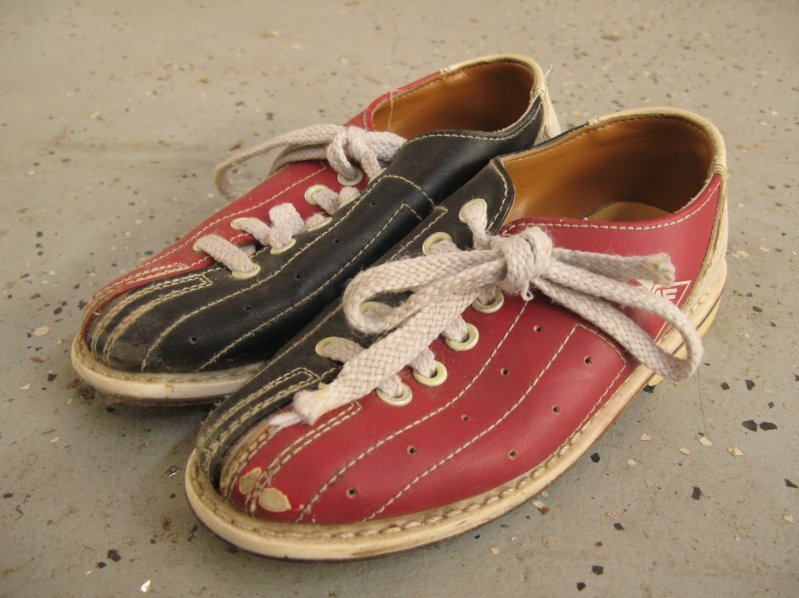 Historically, we’d always had bad games on the end lanes… something about bowling beside a wall just bothered me, particularly. Nevertheless, the first of the three-game championship set began—and we promptly lost it. While “One Eye Open” celebrated their opening round victory, Rodney and I made what football players refer to as “halftime adjustments”. This consisted of a quick trip to the trusty vending machine almost directly behind us, where I proceeded to get my Mike and Ikes. To my knowledge, Mike and Ike candies don’t contain anything that could equate to performance enhancing drugs, but like magic, games 2 and 3 turned around for us dramatically—and we won them both. We’d done it—we’d won the league, and the $1,000 prize! 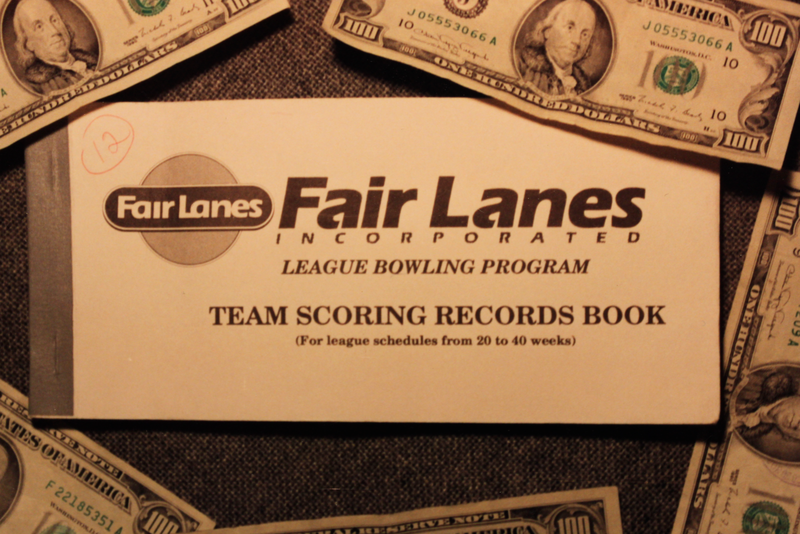 And as if those past 12 weeks hadn’t been stressful enough, let me assure you of this—you haven’t truly lived until you walk through an empty bowling alley parking lot in Laurel—at midnight—with a thousand dollars cash in your pocket. It’s hard to believe that’s been 20 years ago already. It’s no longer Fair Lanes, of course, but the old bowling alley is still there. Maybe it’s time Rodney and I give it another shot. Hey, as long as they still sell Mike and Ikes, anything’s possible.